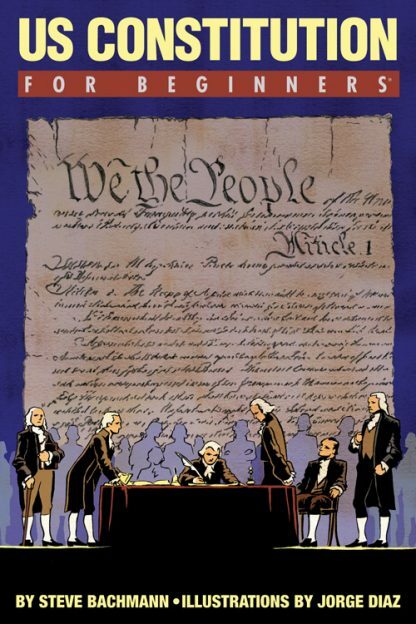 In a combination of witty text and illustrations U.S. Constitution For Beginners take a tongue-in-cheek look at America�s most critical legal document. Author and lawyer Steve Bachmann has written a text that touches on the document�s history beginning with the Magna Carta. He then traces the events that precipitated its writing, the personalities and motives of the people who create it, and its use and misuses since ratification. U.S. Constitution For Beginners analyzes crucial elements of this binding set of principles and ponders the future of the Constitution as well as the role of American citizens. Though hotly debated and constantly reinterpreted, the Constitution has survived wars, industrialization, expansion and politicians. Jorge Diaz graduated from the Savannah College of Art and Design in 1999 with double Bachelors of fine arts degrees in Computer and Sequential Art. From 1999 to 2007 Diaz worked as digital artist and game designer for Vicarious Visions Inc and currently is a game designer for 1st Playable Productions LLC. To date he has contributed to almost 40 handheld titles ranging from the Game Boy Color to the Nintendo DS. In 2005 Diaz became co-proprietor of an independent art materials store Central Art Supply (now Pigment Art Supply). And in 2007, he began self-publishing print on demand Graphic Novels with three complete titles available online. Jorge Diaz is currently an active member of the Albany New York�s Upstate Artist Guild.